On the South Face of Kailash there is a manifestation of a miraculous symbolic map, a kind of scheme showing the evolution of man in accordance with the Higher Law. It is like a reminder about the Way that should be followed by man in order to realize the Divine Plan. On the incline on the southern face there is an amazing fracture cutting the South Face in two parts. This fracture starts near the top of the Mountain, gradually extends at the middle part, and then narrows again and disappears at a height of 6,000 m where the inclined face turns into a vertical wall. This fracture exposes twelve layers of the mountain forming the twelve steps. As such, it is a kind of an axis that links the material world where we live with the subtle world — the world of Gods and the Origin — where we all came from and where we will go back. So, our spirit is going through this kind of Stairways. Once upon a time the Spirit «fell» down these Stairways and manifested itself in the physical world. And now it’s time to climb up to its original sources. 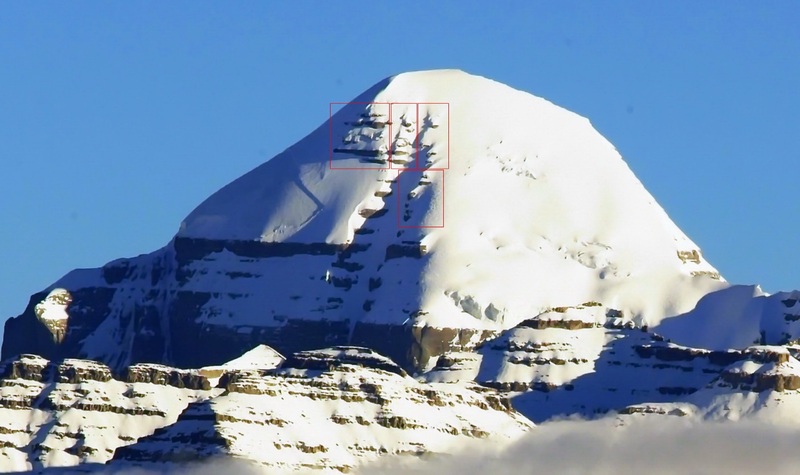 The South Face of Kailash represents a kind of a map that helps use this Complex as a «device» that allows to solve the most important task of a human being in our physical world — acquisition of spiritual experience through a body. The projections in the top half of the fracture on Kailash form a man’s profile. And above it there are three divine images. According to Hindu concepts, Kailash is the throne of Shiva who resides there in inseparable unity with his divine consort — Parvati. To the right of the fracture, there is a beautiful woman’s profile, Parvati, granting love and favoring. And to the left, face forward, there is a half of a male face, Shiva’s one, that represents his creative aspect. But Shiva also has a destructive aspect which is represented by a frightening face on the left. Destruction is deletion of Karmic constituent, purification of physical and spiritual bodies, and creation is making a new program. All that one can realize during the kora around Mt Kailash! The Kailash Complex is a huge natural mandala each part of which is characterized by its specific qualities. The top of Kailash allows a person to be united with the Center of the Earth. The South Face, associated with the element of Water, is the link between the manifested and secret worlds, as well as between the terrestrial and celestial worlds. To the full extent it is possible to experience during the passage of the inner kora (Nandi Kora). The West Face of Kailash, associated with the element of Air, makes it possible to realize Absolute Love. The North Face of Kailash, associated with the element of Ether, helps realize Knowledge. The East Face of Kailash associated with the element of Fire, is a kind of a Gate inside Kailash. The way inside is open only to those who are able to interact with all the elements manifested in the Faces of Kailash and realize corresponding qualities, and who are able to pass the purification by fire energies of the Valley of Life and Death.